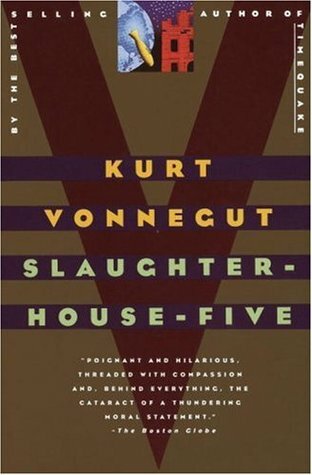 » Slaughterhouse-Five — Kurt Vonnegut Jr.
Billy Pilgrim is a man who does quite a lot of time-traveling. He gets to see his hospital stays, near-death experiences, death, his time of being a prisoner of war, and such. He was once kidnapped by an alien species called Tralfamadorians from Tralfamadore and put in a zoo. So it goes. This is a deep novel. At first it seems very simplistic and comical, with humour being used often. It is the good kind too, one that made me actually laugh out loud in a room full of people that immediately wanted to know what the hell I was reading. Some moments are just splendid. Such as the hospital scene where Billy lies with Rumfoord, and the older man tells him to pity the men who had to bomb Dresden. It appeared meaningful and logical. A look at the other side, I suppose. Vonnegut's writing style was very original, and I really enjoyed it. I have seen complaints of "so it goes" being constantly repeated, but quite frankly, it did not bother me at all. I actually think it made the story flow better and seem more complete. I don't know. I also enjoyed the time-traveling, and it was actually easy to keep up with Billy as he went from his nice home to planet Tralfamadore to World War II again. Also something very original, yet also made me ponder on whether or not Billy was actually sane. This has been an amazing read. I am glad I picked up this book. » A Child Called It — Dave Pelzer. » The Giving Tree — Shel Silverstein. » The Lovely Bones — Alice Sebold. » Lord of the Flies — William Golding. » Betrayed — P.C. + Kristin Cast. » Marked — P.C. + Kristin Cast. » The Last Hope — Erin Hunter.